We looked at the most popular mattresses for side sleepers on the market and looked at what the mattresses were made of, cost, special features (toppers, covers, etc) and what customers had to say about the different mattresses once they had them home and were sleeping on them. The three mattresses featured below came out on top in all the categories. Any one of them would be an excellent choice for a side sleeper. Side sleeping is a very common way for people to sleep as opposed to sleeping on their backs or stomachs. If you are among the many side sleepers you may have discovered that sleeping on the wrong mattress can cause some pain if the mattress you are sleeping on isn’t the right kind for side sleepers. What causes the pain is the pressure that a mattress that is too firm can cause on the hips and shoulders. The body ends up out of alignment which is not comfortable at all. There are things that a side sleeper can consider and look for when searching for a mattress that works for the side sleeping position they favor. This guide is designed to help you understand what things to consider and look for and how to tell if the mattress you are considering is one that will enable you to sleep comfortably and wake up without pain. 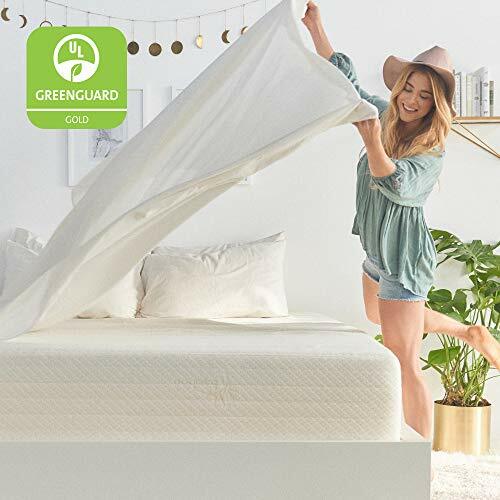 Brentwood Home’s Bamboo Gel mattress features 3 ½” of gel infused memory foam that responds to each person different according to their weight, body temperature and body shape. It is a perfect choice for side sleepers as it does not put undue pressure on the back, hips or shoulders. This comfortable mattress is 13” high. It is made with foams from CertiPUR-US that are free of heavy metals, phthalates, flame retardants, and formaldehyde. Proper spinal alignment is encouraged and tossing and turning will become a thing of the past. The bamboo cover has a zipper closure and is lined with wool from New Zealand that regulates the body’s temperature and wicks away moisture from the body so you stay comfortable all night long. The antimicrobial properties automatically prevent odor and it can be removed and spot cleaned easily. The ventilated airflow evenly disperses heat through the mattress which prevents hot spots. The memory foam this mattress is made of responds to movements quickly so you can move around the bed without feeling like you are sinking. There is a 25 year warranty on this mattress that protects you from any premature sagging of the mattress or defects. 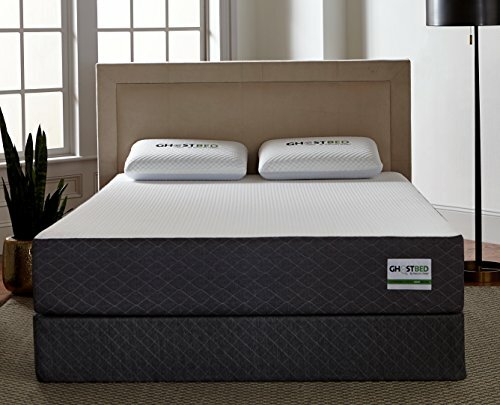 If you’re looking for the perfect mattress for your room and you are a side sleeper, look no further than the Ghostbed Memory Foam Luxury Mattress. It provides you with 11” of superior comfort. The foundation of the Ghostbed will need to be purchased separately. The construction of this mattress includes 1 ½” of premium latex that conforms to the shape of your body, providing softness and comfort. Next is 2” of gel infused memory foam that minimizes the pressure points that can cause discomfort and pain in the shoulders, back and hips. The foundation is made from 7 ½” of extra high density core foam which creates a balance of support, durability and comfort. You will be able to fall asleep easier and stay asleep due to the temperature regulating properties of the bed as well. This comfortable mattress comes with a 20 year warranty and there is a smooth top cover with quilted sides and a zipper. Sleep Innovations brings you a mattress that is perfect for you if you are a side sleeper. It offers cradling comfort that also provides plenty of support. It has a medium yet firm feel and is designed for the average to bigger body frame. If you toss and turn a lot or have a hard time getting comfortable, this is the mattress for you. The quilted poly cotton mattress cover has a luxurious feel to it that adds to its comfort. The cool layer on top is made of 2” of cooling gel memory foam that keeps your temperature comfortable and not too hot all night long. The middle layer is comprised of 2” of air channel foam and the bottom layer is 8” of support plus foam for a total of 12” of supreme comfort. This comfortable mattress comes with a 10 year limited warranty against defects or premature sagging. It comes vacuum packed so shipping and handling is easy. The pressure point relief has been proven to help alignment and helps you wake up refreshed and not in pain. Finding the right mattress is paramount to getting a good, restful night’s sleep. Since people sleep all different ways including on their side, back, and stomach. If you are a side sleeper, it is important to look for a mattress that works with that position so your sleep is restful and comfortable as well. The three mattresses reviewed above are the best of the best and feature comfortable construction that is designed for side sleepers. They are also great for those who feel too warm during sleep and keep the body’s temperature regulated. Another benefit to all three of these top rated mattresses for side sleepers is that they all come with excellent, long term warranties that protect it against wearing out before its time. To learn more about choosing the right mattress for a side sleeper, read the buyer’s guide below. It contains information that will help you look for the right features and construction that will enable you to sleep comfortably and wake up refreshed and feeling rested. The right knowledge ensures that you make an informed decision on the best mattress for your personal needs and preferences, including the position you sleep in. There are several different mattress firmness styles that you can choose from. If you are a side sleeper you will want to be sure that you choose the right firmness level so you sleep comfortably and wake without pain. Soft – Mattresses that are soft offer little to no support but they are usually exceptionally comfortable. Side sleepers like soft mattresses because they can sink into them and the uncomfortable pressure points aren’t there. If you decide to go for a soft mattress, you want to make sure that it does offer some support as well. Memory foam is a good choice. Medium – Medium mattresses are a combination of support and firmness. Side sleepers do well on medium firm mattresses because they are not too firm and unyielding but offer good support. Firm – Firm mattresses offer plenty of support but this support is best for those that like to sleep on their backs. If you’re a side sleeper you’ll find that a firm mattress will put a lot of pressure on the shoulders and knees which cause a significant amount of pain and discomfort. Next on the list of things to consider is the amount of support the mattress provides. You want to look for a mattress that will support all parts of the body equally. This will put the same amount of pressure on the legs, core, shoulders and hips instead of having certain parts that get more pressure. Neck and back pain is a common complaint that side sleepers have. A sagging mattress can contribute to this pain and even be a cause. The way a mattress surrounds your body as you are sleeping is called conformability. This is a very important point for side sleepers. You want to keep your spine in alignment while you’re sleeping. When a mattress offers the right amount of comfort and support the heavier parts of your body will simply sink into the mattress while the rest of your body has the support it needs as well. The result is stable alignment for the entire body. We have listed the different types of mattresses on the market. Not all of these mattresses will work for a side sleeper. We will provide characteristics of each type along with how side sleepers usually handle them. Innerspring Mattress – An innerspring mattress isn’t the best choice for a side sleeper. Even with updated technologies, there is not a lot of conformability that an innerspring offers unless there is a super thick pad or topper on them. 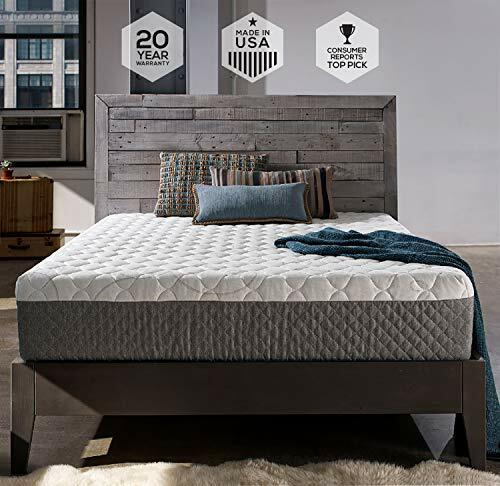 If you are stuck with an innerspring mattress, one of the best ways to make it work for a side sleeper is to add a good quality mattress topper made of thick memory foam. Water Mattress – Waterbeds used to be super popular beds to have. They are not nearly as popular as they used to be and that is not surprising. Water beds do not offer any kind of support regardless of the sleep position you prefer. Waterbeds can have adjustable firmness settings but there is no conformability with this type of mattress. Air Mattress – Out of all the different types of mattresses, an air mattress is the second best choice for anyone who prefers to sleep on their side. When it is inflated properly there is a huge amount of conformability and lots of support. Sagging is not something you will have to worry about either. The air mattress is adjustable by adding or taking air out of the mattress. Latex Mattress – This type of mattress is one of the firmest ones you can find. This is another type of mattress that is not recommended for side sleepers. Futon Mattress – These mattresses double as sofas and are not really good choices for anyone to sleep on but especially side sleepers. They are typically very thin and there is not enough softness or conformability for side sleepers to find any kind of comfort on them. Memory Foam – This is the number one choice of mattresses for side sleepers due to the excellent conformability. Density is an important factor to consider when choosing a memory foam mattress. This will determine the firmness which you want to be medium, neither too soft nor too firm. Now that you’ve been given information that will help you understand what the body goes through when you sleep on your side and how mattress types play a part in the discomfort or comfort level, you will be able to better sort through all the different types and choices and make an informed selection as to the right mattress for your needs. Ultimately, the mattress a side sleeper wants to look for is one that has a thick support layer of high density foam and a medium to soft; comfort layer is the best combination. The right comfort layer will provide what you need to relieve any pressure that is being put on your shoulders and hips. The support layers ensure that the mattress will not sag and allows for the body to be fully supported at all points. Other features will include cooling gel that keeps you comfortably cool all night and other comfort level features as well. Side sleeping is one of the best positions to keep your body in alignment but only if you choose a mattress that supports this. With so many people choosing side sleeping as their preferred method, there are many great memory foam mattresses out there that are designed with the side sleeper in mind. Be sure to look into any trial periods the manufacturer offers. Some companies will actually let you try out the mattress for 60-90 days or more before you pay. This is a great way to find out if it is a good fit for you. Be aware of the possible fine print and make sure that you are not responsible for the cost of shipping the mattress back if you don’t like it. There are all kinds of trials out there, and some make the consumer pay for the return shipping and some do not. Choosing the right mattress for side sleepers will enable you to sleep well and wake up refreshed, alert and most importantly, pain free.